It’s not often that I am sent an electrical cat product that is practically silent. However, this beautiful kitty drinking water fountain hardly makes a peep so perfect for all cat types and owners listening out for annoying intrusive buzzing!! It is, in fact, the quietest water fountain I have found on the market. 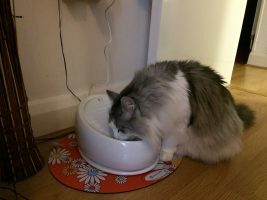 My Norwegian Forest cat, Kiki, enjoy her new Lucky Kitty Water Fountain. Note the lovely orange flower rubber mat that can be purchased with the fountain. I first noticed the water fountain at the 2016 Vet Show at Excel when I walked past a stand and noticed a lovely crisp looking ceramic bowl which was being showcased on a small stand. It’s clean and simple looking design drew me in, mainly because it’s the type of cat bowl I would have in my home. When I got closer to the fountain I put my ear to the running water expecting to hear an electrical buzz but nothing. Impressed I started to talk to the designers on the stand. ‘You won’t hear a thing’ they said quickly. ‘It’s the quietest fountain on the market’ and, indeed, they were right. I was sent the fountain to try and and my cats ADORE it. At first they ignored the fountain, being creatures of habit, but were soon lapping up the running water and fighting over who got there first! The bowl is very easy to wash, really easy to put together and comes in various pastel shades as well as white, which I liked. The only time the fountain makes a audible sound is when the filter needs a clean, if there is air in the filter tube or when the water needs topping up. 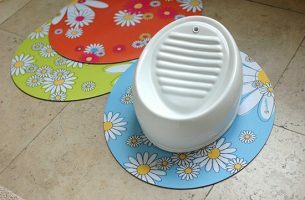 The bowl can be bought with beautiful colourful rubber matts which makes any spillage of water easy to mop up. Running water is exciting for cats. They can’t get enough of drinking from our taps, our toilet bowls from puddles outside or other water outlets, such as when we are in the shower, so this fountain is perfect to meet any kitties running water needs. The Lucky Kitty Fountain retails are Euro’s 54.90 plus shipping costs. Tax is included in the price. All in all a 5 star product that looks lovely in the home as well as being practical. A lovely drinking fountain for your kitty. How lucky is that!!! I was not paid for reviewing this item. All feedback is genuine.